Enough Wealth: Return to study next year? I haven't been enrolled in any part-time postgraduate courses this year. Last year I'd been enrolled simultaneously in both a BEd degree and MIT degree (by distance education). The combination of full-time work, a young family (2 and 8 year old boys) with attention-demanding health issues (severe eczema), and going on holiday overseas for 6 weeks during the semester led to my dropping out of the BEd subjects I'd enrolled in and getting excluded for not making satisfactory progress. I had been on an approved leave of absence from the MIT course, but then received a notice of exclusion just before Christmas for not meeting the progress requirements! I initially ignored the notice as they'd sent me the same last year by mistake. However, when I tried to complete enrolling in subjects for this year I found out that it wasn't a mistake. By then I had missed the deadline for appealing against the exclusion (I thought being on approved leave was a pretty good reason for not progressing), and would first have had to apply for special permission to make a "late appeal". In the end I decided that it wasn't worth the effort to even seek leave to appeal against exclusion, as I didn't fancy my chances of passing all the subjects I'd have to have completed this year to meet progress conditions. I also didn't bother completing the assessment items for the Diploma of Financial Planning I'd enrolled in the previous year. I might still complete the items if I get bored during the Christmas holidays, but the career prospects in financial planning have dimmed a lot with the GFC and with the Australian regulator looking closely at commission-based remuneration in the planning industry. I really don't think enough people value financial planning enough to pay significant up-front fee-for-service. 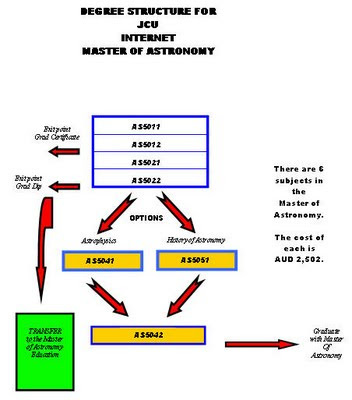 Anyhow, I recently found out about an Internet-based MoA (Master of Astronomy) course run by James Cook University in Townsville. I've applied for admission, as I've always been keen on Astronomy as a hobby (I bought a 10" Meade SC telescope about 20 years ago) and have a suitable undergraduate degree and a Grad Dip in Industrial Math and Computing. I won't find out if I've been offered a place until the New Year, but I've already ordered a copy of the text for the first two subjects from Amazon.com (it cost around A$120 delivered from Amazon, compared to about A$150 for the same book from a local Sydney university book store!). The MoA course *should* take three years to complete part-time, and cost about A$15,000. If all goes well I'd then like to progress to the DoA or PhD course (although I'll be in my mid-50s by the time I finish a doctorate). This study will be purely for fun, as I intend to stay in my current non-academic job until I retire, athough it would be cool to publish a few research papers "on the side". Sometimes I miss my old job as a research scientist. I don't think it's mad at all, I'm an eternal student, it's rare for me not to be enrolled in something, at the moment I'm completing two Cert IV's and I've just applied for my Masters next year. I love studying and can't imagine not doing it!